Author Signe Miranda is one of my music industry peers in Toronto, Canada. We share an affinity for songwriting, musicianship and personal success. I jumped at the opportunity to read her book, The Song Creation Formula, because songwriting — more than any other activity — allows me to feel in flow. As such, I wanted to learn about Miranda’s process, learn about the songwriters she interviewed and learn about contributing author Taylor Abrahamse’s chord patterns framework. 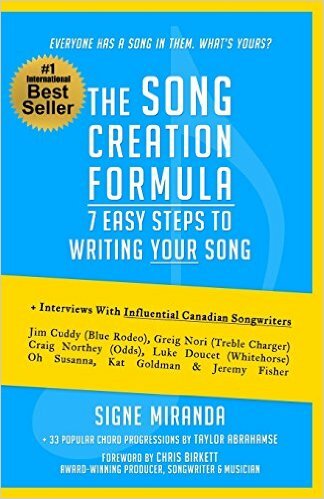 Miranda and Abrahamse, in parallel with their clear love of songwriting, host a Toronto-based songwriting workshop, whose introductory class I attended before reading this book. The experience gave me some in-person reference material. It was an organized and thoughtful workshop which highlighted the songwriting ability of both authors. Their friendliness and desire to share their knowledge was as obvious in the class as it is in their book. The Song Creation Formula is highly Canadian in terms of Miranda’s personal references and in terms of the 7 songwriters she interviewed. This made it easy for me (a Canadian) to relate to most of the songs, people and places mentioned. For any reader who is unfamiliar with Canada’s music scene, certainly many of the references can be found via web search. The relatively short read (133 pages) is split approximately as 10% Miranda’s Song Creation Formula, 50% interviews with 7 songwriters and 25% Abrahamse’s chord progressions framework. The rest is Miranda’s commentary or resources. I thought this book had the potential to be 3 separate and longer books. Miranda’s personal story was enjoyable to read, so much that I would have liked to learn more about her recent years as a songwriter and enjoy smaller stories like finishing songs for an album. The 7 songwriter interviews were delicious enough for me to hunger for more. Each songwriter had their unique perspective and made me feel like I was one of their artistic comrades. The interviews were short-ish but interesting — there aren’t many such interviews. And finally, Abrahamse’s chord progressions framework was excellent because it offered digestible generalizations for song chord patterns. The song examples he refers to at the end of each pattern are popular and stylistically varied enough to make you think, “I know what he’s talking about thanks to that song.” The section did make me pine for more info, especially on the behalf of ultra-beginners. I would have loved to hear an audiobook version of this book because hearing is believing. For now, an enjoyable text reading will have to do. 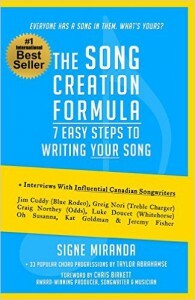 I recommend this book for aspiring and experienced songwriters, or for anybody who would enjoy reading short interviews from some talented Canadians. We appreciate the kind review! By the way, if you would like an extended version of my chapter, you can head on over to http://www.songcreationformula.com and get it for free, as well as a resource that pinpoints where each chord progression shows up in each example given in that chapter.